What are the Different Types of Resistance Training? Dumbbell curls are an effective way to build stronger biceps by providing weight resistance to the muscle group. 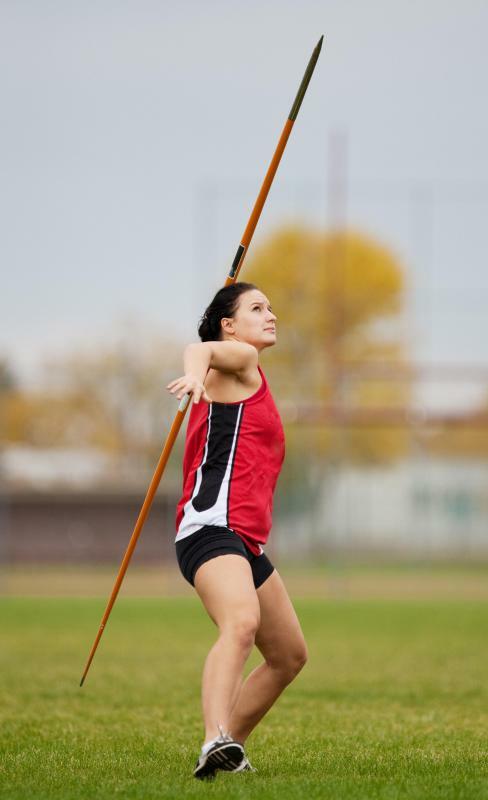 Activities such as the javelin throw and rock climbing use isotonic exercises as part of the training. 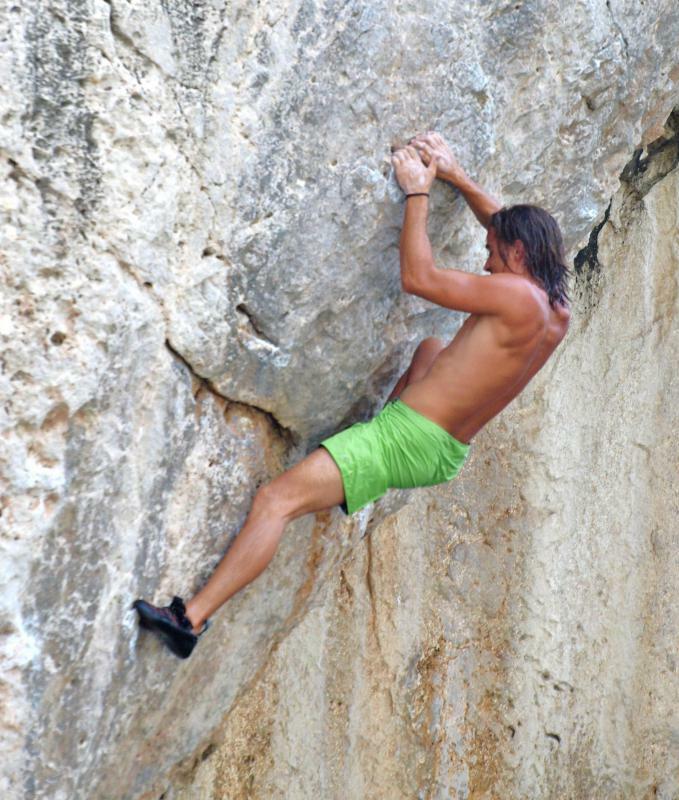 Rock climbers use isotonic exercises as part of their training. Barbell lifting is a popular type of resistance training. Swimming is an effective resistance training. Resistance training can generally be categorized into three types: isotonic, isometric and isokinetic. These training types largely depend on the kind of resistance used. The commonality among these three types is that they provide a large range of motion for the muscles in order to improve muscular strength. The first type is the isotonic resistance training, in which a muscle moves against a resisting object. Common tools used in this type of training are weights, barbells, and dumbbells. To improve resistance, most, if not all, isotonic exercises use two contractions: concentric and eccentric contractions. Concentric contractions happen when the muscles are moving against a weight, such as when a person raises a barbell above his head. This makes the muscles shorter. An eccentric contraction lengthens the muscles when they act towards the direction of gravity. An example of this is when a person lying down slowly puts down a barbell. Aside from using weights, isotonic resistance training can also be applied in different sports. Swimming, especially the butterfly stroke, is an effective resistance sports because the swimmer pushes against the water. Rock climbing, javelin throw, and even basketball also use isotonic exercises as part of the training. Isometric resistance training is different from isotonic because it uses immobile resistance, such as the floor or the wall. Muscles do not experience repeated shortening and lengthening, but are still worked out by repetition and by holding a certain position for several seconds. This type of training is probably the cheapest and the most convenient, since it does not need any equipment or weight. It can also be done easily at home. An example of an isometric exercise is the side bridge. A person leans sideways against the floor using his lower arm and pushes himself up and down. Another exercise is the plank bridge, which is similar to a pushup, only the person uses his lower arms to push himself off, instead of using the palms. The third type of resistance training is isokinetic, which enables the muscles to move at a steady and constant pace. This type of training takes advantage of different gym equipment to move the muscle in a wider motion range. The machines also helps imitate some movements used in sports, such as kicks and pitches. Some equipment a person can use are the leg curl and press machine, weight stack machine, and the stationary bicycle. The advantage of isokinetic resistance training is that a person can adjust the weight and speed the machine operates on according to his need and capability. What Is Elastic Resistance Training? What Is a Resistance Trainer? What are the Different Types of Resistance Training Machines? What are the Benefits of Resistance Training for Women? What are the Different Types of Resistance Training Exercises? What are the Different Types of Resistance Training Weights?